From 7 to 13 February 2017, the city of Kuala Lumpur, Malaysia, will host the ninth edition of the World Urban Forum (WUF9). The theme for this year’s edition is: “Cities 2030, Cities for All: Implementing the New Urban Agenda”. WUF9 will be the first forum after the 2016 United Nations Conference on Housing and Sustainable Urban Development - Habitat III. UCLG is mobilizing a delegation of mayors and local elected officials, and is facilitating the presence of all the member networks of the Global Taskforce of Local and Regional Governments in the Forum. Created in 2001 by the United Nations, the World Urban Forum is the world's leading conference that tackles the challenges of urbanization. The Forum brings together a wide range of elected officials from all levels of government: national, regional and local governments, as well as experts and non-governmental organizations, community organizations, professionals, research institutes, development finance institutions, foundations, United Nations agencies and other international organizations. Advocate for and raise awareness of sustainable urban development. Advance collective knowledge on sustainable urbanization through open and inclusive debates and the exchange of experiences and best practices. Encourage cooperation within and among the different groups for the follow-up and implementation of the Habitat Agenda. UCLG will be coordinating the participation of the Global Taskforce (GTF) in the WUF, which will be organized around the main event: World Assembly of Local and Regional Governments. As facilitator of the Global Taskforce of Local and Regional Governments, UCLG facilitated the organization of the Second World Assembly in Quito on 16 October 2016. Hundreds of local leaders and elected officials gathered to present a joint statement to the Habitat III Conference, and to commit to contribute to the New Urban Agenda. A session of the World Assembly of Local and Regional Governments will meet in Kuala Lumpur to follow-up on the progress on the implementation of the global goals and the New Urban Agenda from a local perspective. Local and regional leaders, representing various global networks of local and regional governments, will meet for this occasion on 8 February 2018 from 11:00 to 14:30. UCLG members and partners of the Global Taskforce will have many opportunities to actively participate in round tables and side events during the World Forum. 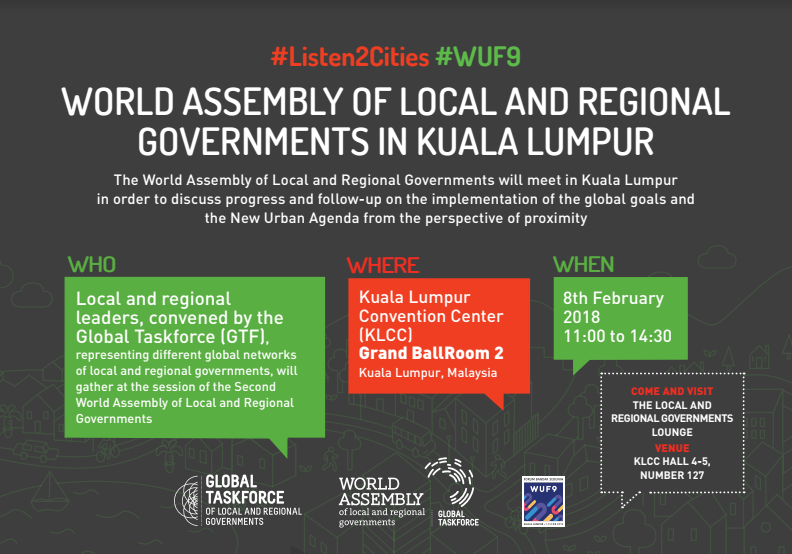 UCLG is facilitating the presence of all local and regional government networks at official WUF9 sessions. Our members, committees and partners are organizing a range of sessions and events. UCLG will manage the Local and Regional Government Lounge. Our team will be happy to welcome you to the Global Taskforce Lounge, located a few steps away from the official UN-Habitat Pavilion. It will be impossible not to see us! The Local and Regional Governments Lounge will serve as a platform, a workspace, and a place for presentations and networking that will ensure our visibility and coordination during the World Urban Forum.